I started writing this blog in the summer of 2011, which means this is my sixth year of putting words and pictures here for posterity to look at some day. In 2015, my blog was viewed in 82 countries, and on every continent except Antarctica. The number of viewers has never interested me very much, but I love the global reach that doing this affords. It is the World Wide Web, for certain. My Northwestern Wildcats got crushed in their bowl game today, so the year isn’t off to such a great start. But if that’s the worst thing that happens to me today, I’m still exceedingly blessed. Here’s to a year filled with interesting events, good times, and Bernie Sanders, too. 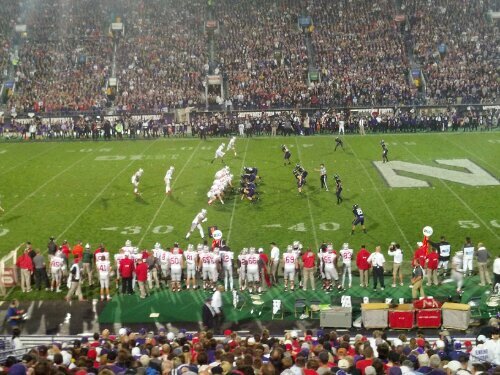 In 2013, I was in the stands in Evanston when Ohio State came to town. I got up at halftime to stretch my legs, and was taken aback by all the trash talk I heard from Buckeye fans about the stadium where the Wildcats play. In their minds, apparently, having a big stadium makes them superior to places that don’t have one. The truth is that a 90,000 seat stadium would just never work in the leafy North Shore environs where the Wildcats play, and very few games at Ryan Field ever sell out, anyway. But bad-mouthing a host never seems like a good idea, in football or anywhere else. Ohio State won that game, as they win almost all the games they play. But a big stadium wasn’t enough to save them yesterday, and my feeling of schadenfreude toward those fans today is off the charts. It’s a beautiful fall day as I sit down to type out a few words on my smartphone. Blogging gives me a chance to spend a few minutes getting thoughts down, before the moment changes and the feelings are lost. and this is a moment that I want to preserve in some manner. The arrival of fall brings football season, and my alma mater, the Northwestern Wildcats, are playing well. They’re ranked number 17 in the polls, which is a validation of their play by those people who have accorded themselves the right to judge such things. Where this season will end up is a mystery, but I’m looking forward to tonight’s game against Ball State in a way that I wouldn’t normally do. As the philosopher Pete Rose puts it, the burgers taste better when you win. The Chicago Cubs, that other great sporting interest of mine, have clinched a wild card spot, and there will be playoff baseball here for the first time in a while. I hope they will finally get to the World Series and win it, but that remains to be seen, as well. But what’s really great is that these two sports teams that rarely win are doing so at the same time. Rarely do I get to enjoy one team or the other winning on a regular basis, and never have both been successful at the same time. It’s a vortex of success, and I’m not complaining about it one little bit. Well, maybe a younger and more handsome dude than I could be sporting the teams’ gear in the picture above. But I’ll take what’s come along and enjoy it while it lasts. Today I got to meet some fans of the game I love. In everyday life, I’m not always very talkative. In truth, I’ll take writing over speaking every time. But when the subject is baseball, that’s a different story. I could talk about baseball all day long. In the process of talking about the game today, I articulated something that I’ve never thought about too much before. What makes baseball great, in part, is that for six months a year, there are games going on every single day. Football doesn’t have that. Hockey, basketball, and every other team sport makes their fans wait for another game. But not baseball. There’s a game today, there’s a game tomorrow, there’s going to be games on (nearly) every single day until the end of October. And I love that. Football, in particular, seems to be particularly cruel to its fans. Six days out of every week are devoted to talking about a game, analyzing a game, and doing everything except actually playing the game. Not so with baseball. Every day is a chance to start over, to do something memorable, or to atone for something from the previous day. And it gets no better than that. Today–March 26, 2014– is the 35th anniversary of the Magic Johnson/Larry Bird title game in the NCAA tournament. I remember watching that game as a ten year-old kid in Springfield, Illinois. It was broadcast on NBC, instead of on CBS. There was no three point stripe, no shot clock, and no possession arrow. The NCAA logo was some silly interlocking letters arranged inside a circle. The game followed a third-place game, where the two teams that lost in the Final Four still had one last chance to salvage something. In short, there were still five men on a side and the team that scored the most points won the game, but otherwise the modern sports fan would hardly recognize it. And on the anniversary of that game, which arguably changed basketball itself for the next decade, the NLRB handed down a ruling that Northwestern’s football players can vote to form a union. There are many writers and fans bemoaning the ruling, saying that it will “change college sports as we know them.” To which I reply, change happens all the time in life. The NCAA championship game from 1979 (which is within my living memory) is all the proof anyone needs that change is inevitable, in sports and in life itself. To those who would bemoan the loss of something in college athletics, I would invite them to consider that the athletes on the floor in the basketball tournament, and on the field during the bowl games and in the regular season, are generating millions of dollars for their schools, yet they aren’t allowed to share in any of it. The schools do award scholarships and provide room and board, but they keep the money and in turn make their professional coaches into wealthy men. They give the chattering heads of CBS, ESPN, and a thousand other places something to talk about and write about and take pictures of. They allow the advertisers to reach a captive audience and sell more product. And what do these athletes get in return? Not what they should, if you ask me. There will never come a time when the NCAA, in its benevolence, decides to share the wealth with the players who do the work and assume the risks. There will never come a time when a school pays for the long-term medical bills of a player who gets hurt playing a game, while wearing their school’s colors. And there will never come a time when a player who can’t keep up with his academics and his team responsibilities is told that academics are why they are in school. Football comes first, or basketball comes first, and everyone understands this. But it’s wrong and it needs to stop. It’s ironic that the very first Final Four, or the first time that NCAA schools competed on the same floor for a basketball championship, happened on Northwestern’s campus, all the way back in 1939. I know that that was basketball and today’s ruling applies to football, but that’s not the point I’m making here. Northwestern–my alma mater–showed the NCAA the possibilities that a championship tournament offered. And 75 years later the Final Four, and the tournament leading up to it, is a money-making juggernaut. But what Northwestern giveth in basketball, it taketh away in football and–soon enough–in basketball, too. If making money from the toil of players who don’t get to fully share in the pie they create seems fair, I will respectfully disagree with that premise. Million-dollar coaches don’t play the games; the players do. And the false hope of a professional payday–which the overwhelming majority of college athletes will never get to see–is shameful. It’s gone on for too long, and the sooner it comes to an end, the better. Kudos to Kain Colter and the Northwestern football team, for sowing the seeds that will one day bring about some much-needed and long-overdue changes in college sports. The Coca-Cola commercial that was aired during the Super Bowl this year had it exactly right. America is beautiful, because people from all over the world have always come here. They bring their languages and their customs and their foods and their traditions with them, and they hold onto them because it’s what they know best. But their children, and every generation after them, will be Americans, both in word and in deed. 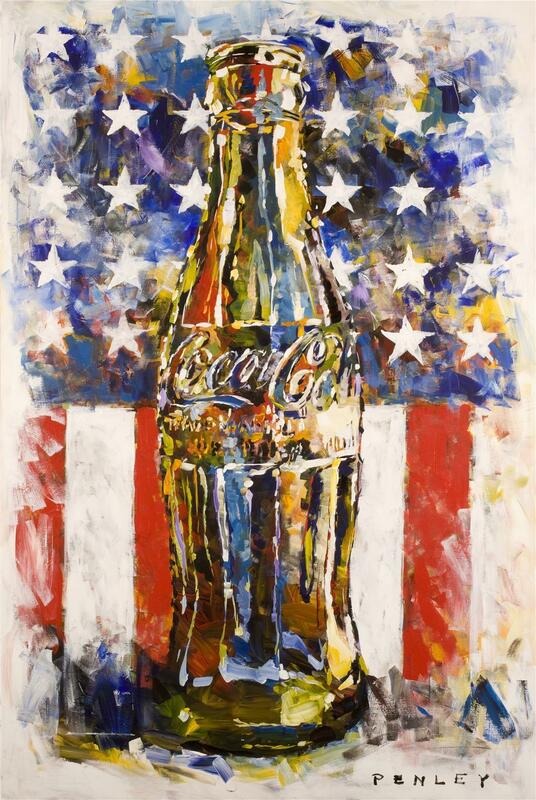 Those who object to the Coke commercial need a lesson in what America really is. But Coke appears to understand it, and I’m proud to be a stockholder in this most American of businesses. Super Bowl Sunday, 1986 was certainly the high point of my senior year in high school. I knew that graduation was four months away, and going off to college would happen a few months after that, and then life would all be different. And that’s exactly what I wanted, to be honest about it. But the Bears made sure that the Springfield chapter of my life finished on a high note. My family always went somewhere to watch the Super Bowl, and in 1986 we went, for the only time I can remember, to my Aunt Francie’s house. The Bears were the team that I had followed since Walter Payton first came to the NFL in the mid-1970s. He was known as “Sweetness” but he never had a team around him in those days. But in the early 1980s, the team started to rise under Mike Ditka. I was too young to know him as a player, but he looked the part of a football coach to me. 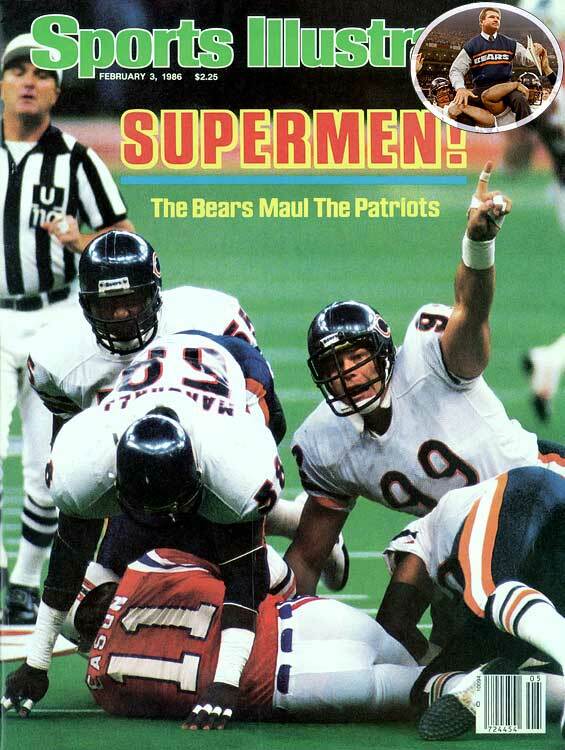 The 1985 Bears will always be the standard by which football teams will be measured. They made football fun, in a way that it had not been before and has not been since. Alongside Walter Payton, there was Jim McMahon, Willie Gault, Dan Hampton, Richard Dent, Mike Singletary, Gary Fencik and, the biggest attraction of all, the Fridge, William Perry. Someone had put a refrigerator outside of their house in my Aunt’s neighborhood, and painted the number 72–the Fridge’s number–on the front. All these years later, and I can still remember it like it happened earlier today. 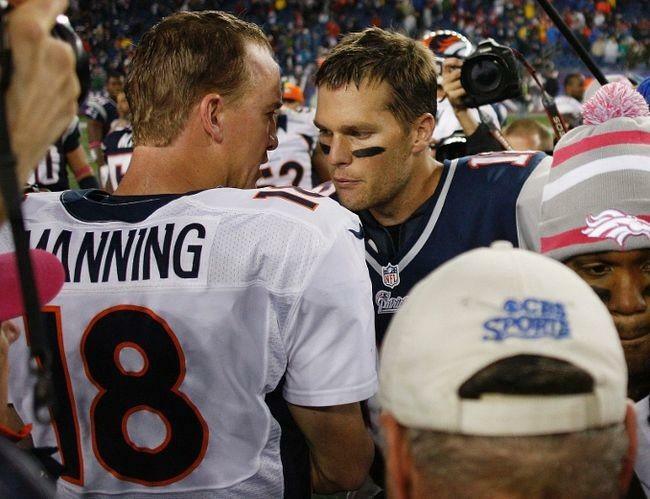 The Super Bowl Shuffle video made them all household names. They lost one game down in Miami on Monday night, but then they never lost again. And maybe the best part of the game was that the Bears overcame an early 3-0 deficit with a stellar performance the rest of the way. Sometimes things go badly at first, and it puts you in a hole that you can’t get out of. But this team shook off the slow start and proceeded to put on a football clinic. It proved that how you start off is much less important than how you finish up. The Bears probably should have won more than just that one Super Bowl, but it didn’t work out that way. It’s now more than a quarter of a century later, and the Bears are still looking for a companion piece to that year’s title. Who knows when we’ll see another one, but for now we can look back at what a special time–and team–that actually was. I now live in Chicago, and I’d love to see what it would be like in this city if the Bears ever rise to that level again. Life has changed since then, as I knew it would, but that special few months in late 1985 and early 1986 are something that will always remain in my memory. Yesterday was the first time that I’ve had a piece published on ChicagoSideSports this year, but I’ve also been active on ThroughTheFenceBaseball and on FiveWideSports. I haven’t promoted them the way that I would like to here, but I’m grateful to have a chance to share some of my thoughts with those in the online community. I remember it well, that New Year’s day in 2010, when Northwestern played the Auburn Tigers in the Outback Bowl. It was the first bowl game of the day, and I was ready for it with a mountain of alcohol. It was rare for me to start drinking before noon, but this was a big game and, well, football. That was all I needed, really. By the time the game had ended, with Northwestern losing in overtime, I was already hammered, and the day was just getting started. By the time the last game ended late in the evening hours, I had watched a ton of football and consumed a ton of alcohol. The two had a symbiotic relationship with each other, to be honest about it. 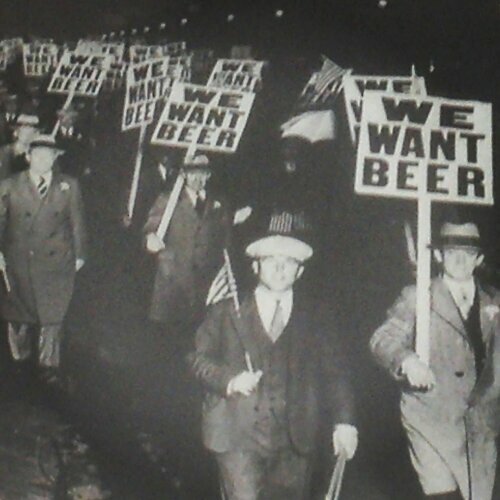 I haven’t had a drink on New Year’s day since then. I’ve also just about cut television out of my life since then. New Year’s day this year consisted of two or three plays of the Wisconsin game (whichever bowl game it was) and–much more importantly–no alcohol whatsoever. It’s a decision that I’m comfortable with, because beer and television once had a long run in my life, and now I’m on to something else. Everything changes, after all. Here’s to another year with little television, and even less liquor. And also to another year of wondering how I ever lived that way. I have no desire to go back to it, that’s for sure. It’s Mike Ditka’s city, and I just happen to live in it. Last Spring, I celebrated Chicago’s annual season of hope by writing out a list of all the reasons I could think of for why Chicago was not only a baseball town, but the best baseball town in all the land. It was a labor of love, and when I saw the piece on ChicagoSide’s web page, I was as happy as I can be. The artwork was a Chicago flag, with baseballs superimposed over the four red stars. It was quite a sight to behold. And, just to make the story even sweeter, the story was picked up to run in the Chicago Sun-Times. For a kid who grew up delivering newspapers to the houses in my neighborhood for six years, it was a dream come true. The thrill of going down to the local 7-11 and buying a stack of them for whoever might want to see it was a special treat, along with thumbing through the paper, looking for the place where the article would appear. It made sense, with the Sun-Times being laid out as it is with the Sports in the back, to flip it over and work from the back cover in. But I reasoned that working from the front cover back would stretch the moment out just a little bit longer. On the front cover of the paper that day was a picture of Roger Ebert, on what turned out to be the day that he passed away. Of all the stories that my grandchildren will half-ignore some day in the future, appearing in Roger Ebert’s newspaper on the day that he died will probably be the very first one. It will always be a special honor to be able to say that. As I worked my way through the local stories, and the opinion pieces, and the classified ads, I began to get excited. The back end of the sports section was coming up soon, and unless some malfunction had come up, I was going to be in it somewhere. The suspense was quite a thrill. And then I came to it, on a two-page spread between pages 66 and 67. “Second to None” the headline blared, along with a large color image of Babe Ruth calling his shot in the 1932 World Series at Wrigley Field. The most storied moment in all of baseball history happened not in New York, or Boston, or St. Louis, but right here in Chicago. And all of Chicago was going to read about it, too. Space limitations were such that only the first 50 reasons could appear on the two pages that day. The other 50 reasons were available on the ChicagoSide website, and my hope is that at least a few of those who saw the story in print made their way to the web site as well. But what came after the teaser at the end of the piece was an unmistakable reminder of the true pecking order of sports in this town. For despite my attempts to raise the public’s consciousness of this city’s baseball history, the lower right corner told me—and anyone else who was paying attention—who really calls the tune around here. “Mike Ditka: Player, Coach, Legend” read the ad, which also included a quote from da Coach and a website for DitkaSteaks.com. I appreciated the irony of a Mike Ditka ad placement on the baseball story I had written. 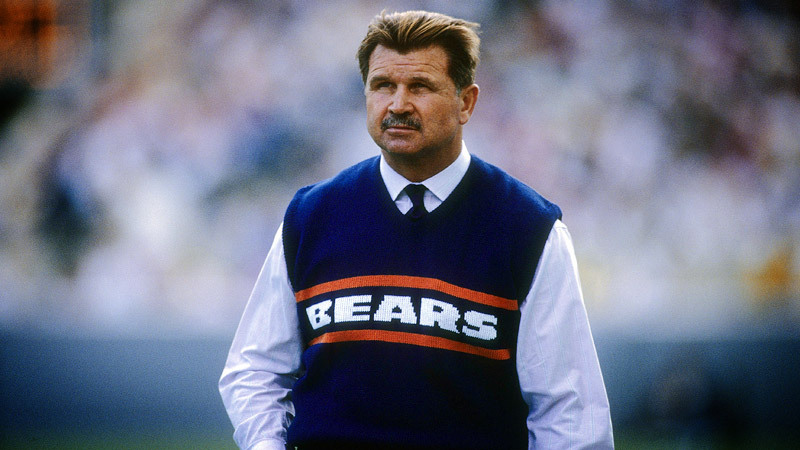 I felt a little bit like Luke Skywalker in the first Star Wars movie, when Han Solo tells him “Don’t get cocky!” For no matter what excitement the piece brought to me personally, I was reminded—and always will be—that Mike Ditka casts a shadow in this town that nobody else can match. Congratulations on the number retirement, Coach, and thanks for all the memories through the years. I haven’t cared about the NFL for a very long time, probably since Mike Ditka was coaching the Bears. So I take my football in smaller doses, usually at the college level. This year, it has also included my high school alma mater, for the first time since I graduated high school. Life can take some unexpected turns sometimes. A few minutes from now, the Cyclones of Sacred Heart-Griffin High will play for the Illinois class 5A championship, and while that game is going on, the Northwestern Wildcats will play the University of Illinois for the title of best FBS school not named Northern Illinois. It’s a down year at the college level, that’s for sure. By early this afternoon, football will join baseball as sports that are in their offseason to me. Basketball and hockey, by comparison, never make it to my radar screen to begin with. Sports as a whole won’t matter again until March at the earliest. But that will be just fine with me. October 5 seems like such a long time ago. On that date, I had high hopes for Northwestern’s football team, which was unbeaten and ranked in the national polls. I had written an exuberant piece for Five Wide Sports a few days earlier, about how it wasn’t 1989 anymore for the two sports teams I truly care about. 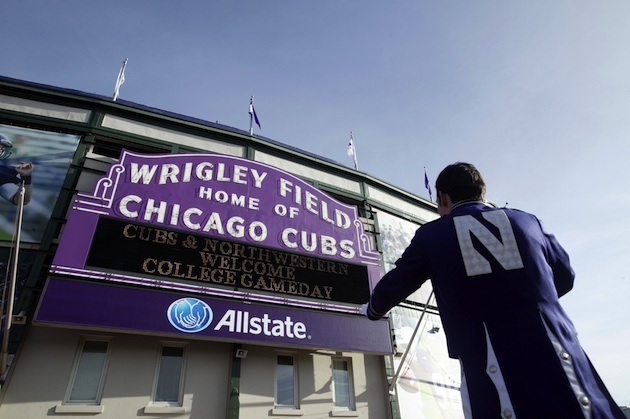 The Chicago Cubs were losing, but the Northwestern football team was winning. The latter helped to take my mind off of the former, and it was a tradeoff I was glad to make. And then, just before Northwestern played Ohio State in a nationally-televised game in primetime, the skies opened up and it started to pour. I wasn’t tailgating at the time, but the thousands who were probably got soaked in the process. I mention this because afternoon rain showers can lead to some interesting sunsets. I saw it when I was in Door County, Wisconsin last summer. An afternoon cloudburst led to a green and brown sunset that I hope I’ll never forget. And the rain before the football game on October 5 also led to a unique sunset. But this was a portentous Northwestern purple, or at least it seemed that way to me. I was driving around in Evanston when I saw it, on my way to the game and trying to find a place to park. There was a buzz in the air, because the rains were gone and it was going to be time for football soon. There were lots of Ohio State fans dressed in scarlet red, but there was a lot of Northwestern purple on display, too. And nature had seemed to decide the matter in the Wildcats’ favor. The picture above probably shouldn’t have been taken in the first place, as I was trying to drive in a crowded situation at the same time. And it doesn’t really doesn’t do the scene justice, either. You can see purple here if you want to see purple. But to me, the purple was impossible to miss. After a parking snafu, I finally found a place to park the car, and my daughter and I went to the stadium to watch the game. Northwestern played Ohio State close right up to the end, and lost when they couldn’t flea-flicker their way to a miracle finish. 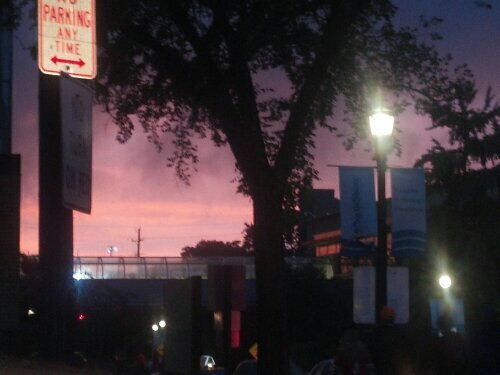 Clearly, the purple sunset hadn’t meant what I thought it did. Northwestern went into a tailspin after the Ohio State game, and they haven’t won a game since then. They have one get left, against Illinois on Saturday. I hope they win this game, at least, to avoid the indignity of a winless season in the Big Ten. It won’t be the first time that has happened, of course, but once upon a time such losing ways were expected. This year’s collapse was completely unforeseen. The purple sunset turned out to have a far different meaning than I had imagined. And the postseason bowl scene won’t have Northwestern involved, for the first time in a while. I’ll miss that part of the holidays, for sure, but then again it’s only a football team. 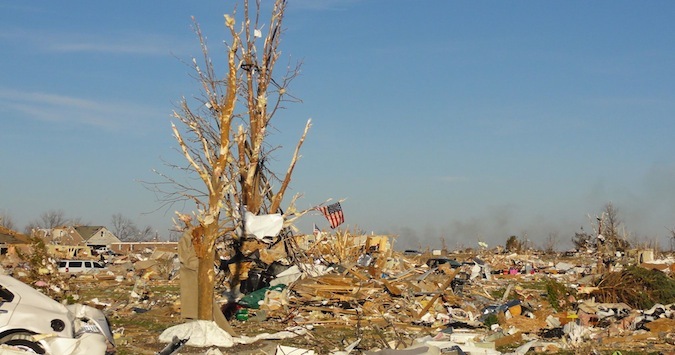 There are more important things in the world, as this year’s tornadoes in central Illinois have made abundantly clear. There are more than false omens that can come from the skies. If disappointment with my alma mater’s football team is all I have to feel bad about, I’ve got a very good life, indeed. …I’ll just watch this instead. It ought to do the trick. Is there any way that something like this happens without alcohol being involved? I sure hope not. And the gif version of this (shown below) is pretty interesting, because it cuts out all of the post-crash commentary. That by itself is a good reason for having gifs. The reason that I write anything on the internet, whether it’s on this blog or anywhere else, is because I love to tell stories. I also like sharing ideas that pop into my head on occasion, but it’s the storytelling that really sustains me. And over the past couple of days, I’ve been able to put one together that I really enjoyed telling. The piece appeared on ChicagoSideSports today. The tragedy that happened in Washington and other places around the state of Illinois last Sunday left me wondering what I could do to help. If I can write something that puts some meat on the bones of what is already a great story of generosity and compassion, I’ll gladly do it. And if I can appeal to the readers of the story to make a donation and help these people out in some way, I’ll gladly do that too. As I wrote this story, a combination of nostalgia and sleep deprivation served to bring my old school back to life, if only for a moment and only within the recesses of my memory. I couldn’t go back and walk the halls of Griffin High, even if I wanted to. But writing this story took me back there in a metaphorical sense. And that’s fine, because now it only exists in my memories and those of my schoolmates, anyway. The building still exists, but it wouldn’t be–and couldn’t be–the same as it was back in the 1980s. I’m rooting for Sacred Heart-Griffin to win this weekend, and not because I graduated from one of its predecessor schools. And it’s not because I want to deny Washington anything, either. No, this is all about being kind and generous. People don’t do that enough, and I wish I saw more of it in this world. So when it does happen, I want to celebrate it as much as possible, in the hopes that I’ll see more of it in the future. That would sure be an improvement over what we have today, wouldn’t it? After still another painful defeat for Northwestern’s football team yeserday, I wrote something about it for FiveWideSports. I thought this was going to be a special year, but not in the way that it has been so far. I’m pretty sure nobody saw this one coming, actually. But there’s just two more games, and then the sporting off season can really begin in earnest. And I’m looking forward to that, in a very odd way. My writing output in this space has fallen off a bit lately. Some of that is because ideas are getting sent to other places, and some of it is that baseball seems to animate my writing somewhat. I recently gave myself three months off from writing forThroughTheFenceBaseball, because I torture myself enough thinking about and writing about the Cubs when the baseball season is going on. But there’s no reason to keep doing that now that the season is officially over. 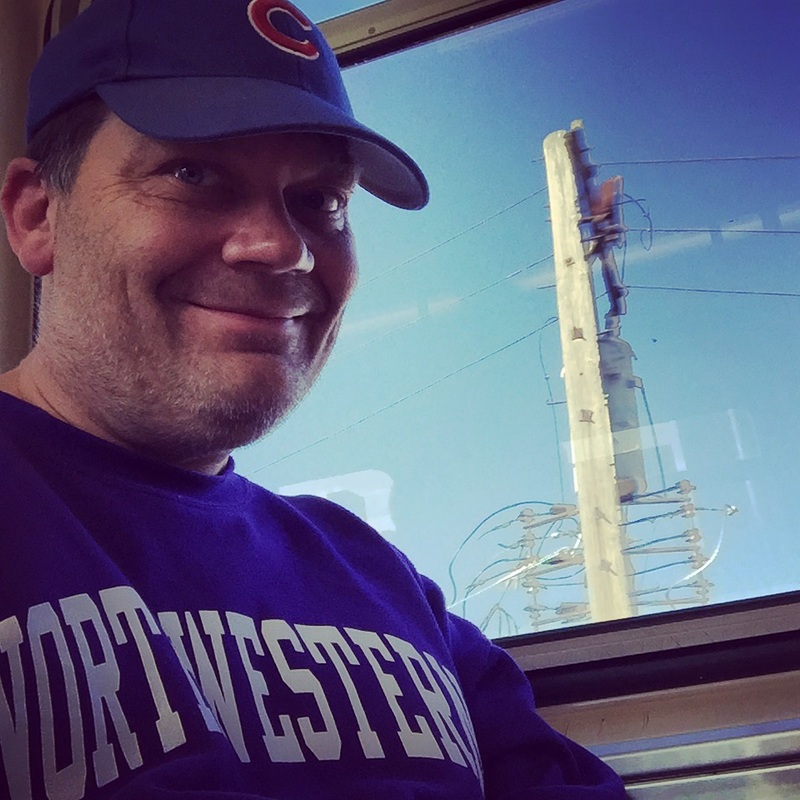 Until further notice, any Cubs-related thoughts will get put here or on FiveWideSports, which I started writing for to comment on Northwestern football. And that has turned unexpectedly painful too, over the past month or so. But I like the idea of sharing a thought with the wider world, and this site–like TTFB–lets me do that when an idea strikes me. 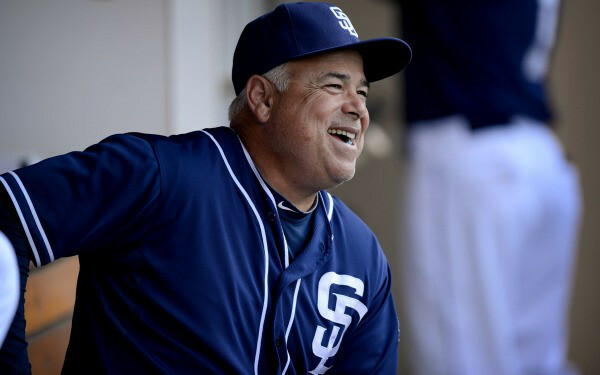 So the Cubs have a new manager named Rick Renteria. I’m not familiar with him, but don’t have any high expectations for him. So I wrote this piece and sent it to FiveWide. You might say I was on a roll when I did it. We’ve known each other for so long….. (and yes, I did go there in the piece, as well). There’s something about this that’s so Chicago. 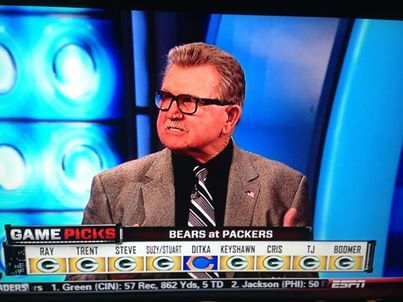 8 of the 9 ESPN football analysts picked the Packers on Monday night in Green Bay, but not Coach Ditka. Is it any wonder that we love him so? Having been at last night’s game between the Northwestern Wildcats and the Ohio State Buckeyes, it was a great game but a difficult loss to swallow. And now I have to change my Rocky metaphors when thinking about the rest of Northwestern’s season. I wrote something to the effect of Northwestern’s two-week period leading up to last night’s game as a training period comparable to Rocky Balboa getting ready to fight Ivan Drago in Rocky IV. Rocky sawed logs and felled trees, and pulled the cart in the snow, and climbed to a mountaintop to show that he was finally ready to face Drago. It was Hollywood cheese, to be sure, but mighty good cheese, just the same. But this time it’s more like the end of the first Rocky film. The two teams went toe-to-toe last night, and in the end the underdog barely lost. Apollo Creed’s declaration that “There ain’t gonna be no rematch!” seems fitting this morning, as Ohio State may not want to see Northwestern again on a football field this season. Rocky II was all about setting up the inevitable rematch between Balboa and Creed. 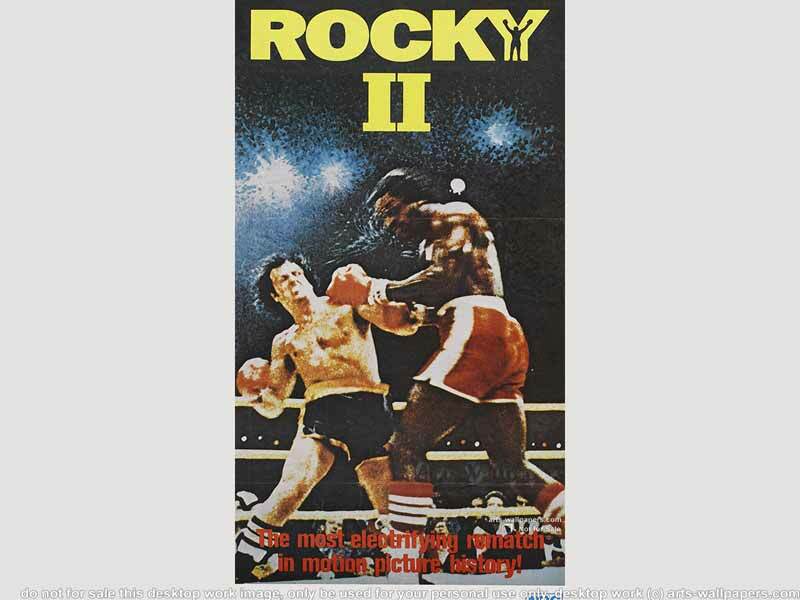 If Rocky had tanked at the box office, there never would have been a Rocky II. And without Rocky II, the rest of the series doesn’t get made, either. Which would have been a shame, in my view. So the Wildcats, who are understandably stung by such a close loss, must fight their way through the rest of the Big Ten schedule this season. If they win the rest of their games–with the home game against Michigan seeming to be the biggest hurdle–they can earn a rematch against Ohio State in the Big Ten Championship game in Indianapolis. I think anyone who watched last night’s game would be happy with that outcome. So no longer is Ohio State Ivan Drago, in my mind. Now they are Apollo Creed, and that’s fine with me. Rocky needed to have Apollo, and the death of Apollo in Rocky IV was a mortal blow to the entire Rocky franchise, in some ways. So let’s get to the rematch, and then win it, to ensure the lasting success of what Pat Fitzgerald is building at Northwestern. 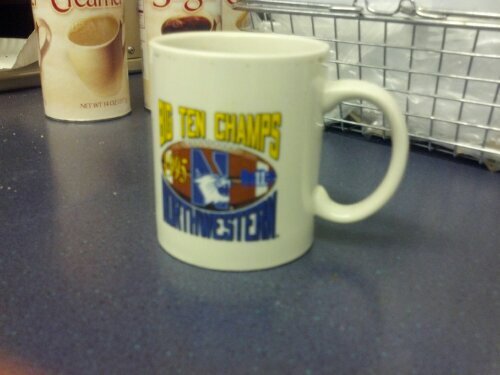 Today I broke out an old coffee mug that commemorated the 1995 season for the Northwestern football team. Ironically enough, it’s probably very close to the year that most of this year’s freshman class was born. Time goes by in a hurry, that’s for certain. 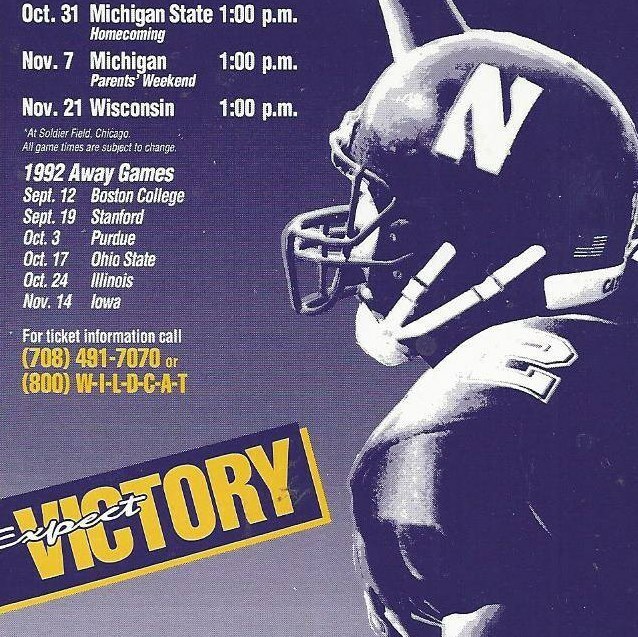 To this point, 1995 is the standard bearer for Northwestern’s football program. And this year could very well end up even better. Should they get past Ohio State this Saturday night, the buzz will grow louder. It’s sure going to be exciting this weekend. I’m happy that FiveWideSports will be carrying some of my thoughts and writings, beginning with this piece that appeared on their site today. I’m still writing for ThroughTheFenceBaseball, and I have a piece appearing there today, as well. 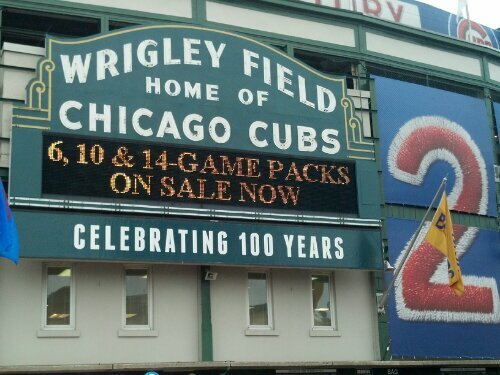 The writing is all Cubs and baseball-related, and a week from now their season will be done. Thankfully. 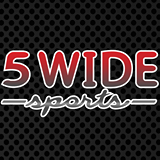 FiveWide is going to give me a chance to write about Northwestern Football and other sports-related things that interest me. I went into a winter’s hibernation of sorts at TTFB last year, and this new site will give me a chance to wander off the baseball subject from time to time. I doubt I’ll ever stray too far from it, though. And then, as always, there’s this blog. That’s going to remain as my go-to for anything else that pops into my head and inspires me to write a few words. After almost 1100 posts over the course of two years plus, I’m pretty sure that well will continue flowing into the foreseeable future.